September 4, 2018 - Swedish companies Volvo and Skanska have started tests at their Electric Site project, where electric and hybrid vehicles are used to complete mining work to determine whether a carbon neutral mining operation is feasible. The site is located at Skanska’s Vikan Kross quarry, near Gothenburg in Sweden, where the vehicles will be tested for the next ten weeks. The project is estimated to see a 95% reduction in carbon emissions and a 25% reduction in the total cost of operations, compared to traditional mining operations. 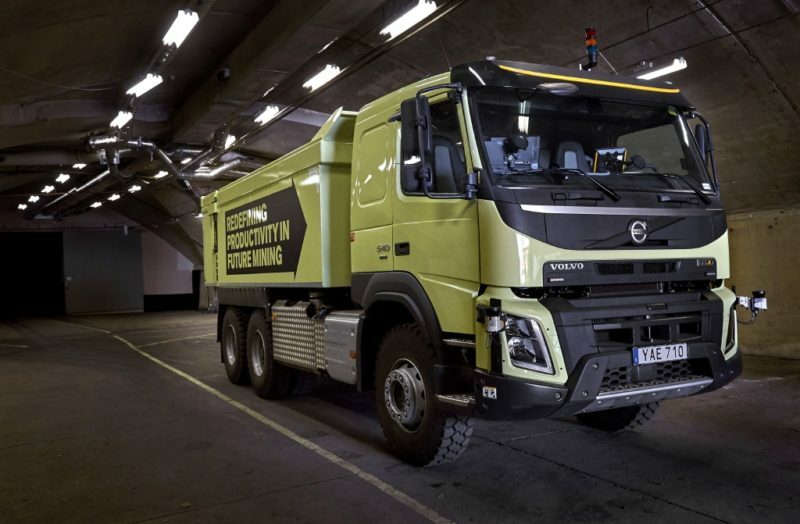 Volvo's FMX truck is an autonomous mining vehicle that was tested in 2016. “This is the first time that anything like this has been attempted in the quarrying industry and, if successful, Electric Site could serve as a blueprint for transforming the efficiency, safety and environmental impact of quarries around the world,” said Skanska Sweden CEO Gunnar Hagman. Volvo has developed three vehicle prototypes for testing at the site: the LX1 hybrid wheel loader, EX1 excavator, which can operate as a hybrid or in all-electric mode, and the HX2 battery-powered load carrier. The Electric Site project is part of the company’s ‘electromobility’ initiative, under which it aims to reduce carbon dioxide emissions and noise levels, without compromising energy efficiency, in its operations. Volvo already supplies 60 hybrid and two all-electric buses to Gothenberg as the city aims to reduce carbon emissions by 20% by 2020. The Electric Site vehicles also use automation to reduce operational inefficiencies and minimise the project’s carbon footprint. The HX2 carrier is an upgraded version of the HX1 model, which was first revealed in September 2016, and has been fitted with a new vision system to enable the carrier to detect and avoid humans and obstacles at the site. The carrier is an autonomous vehicle that transports material between crushers, and the Electric Site project will use eight HX2 prototypes, instead of the larger, more rigid haulers typically used at sites. The HX series is the company’s second autonomous mining vehicle series, and follows the unveiling of the FMX, a self-driving truck that was tested in the Kristineberg mine in Sweden in 2016. Following the tests at the Kristineberg mine and the Electric Site project, it is hoped that similar technology can be used at mining sites on a larger scale.